Late last month, Indonesia saw the return of its infamous forest fires that occur each year producing toxic, choking smog in the form of haze as the rainy season trails off. The fires this time have broken out in the four provinces of South Sumatra, Riau, West Kalimantan and Central Kalimantan. Twenty-three of the 90 hotspots recorded across the country were in West Kalimantan, where thick smoke blanketed the provincial capital Pontianak and disrupted flights. In Riau, one of the hardest-hit regions during the particularly disastrous 2015 season, fires have destroyed 6.4 square kilometres of land, an area double that of New York’s Central Park. This situation prompted the archipelagic nation to declare an "alert emergency" status - just one level below the most severe warning in all four affected provinces. Sutopo Purwo Nugroho, spokesman for the National Disaster Agency (BNPB) stated that this status will allow firefighters and the central government to have better access to resources in order to combat the forest fires. These state of emergencies in Riau and Central Kalimantan will be effective until May while in South Sumatra and West Kalimantan it will run until October and December, respectively. Forest fires are not unfamiliar in the Southeast Asian region, yet alone Indonesia. The most common root of the problem is the practice of forest clearance via the slash and burn method – where the forest is set on fire as a more economical way of clearing land for new cultivation. Peat soil, which characterises much of the areas affected, is highly flammable, causing localised fires to spread while making them difficult to stop, producing sizable amounts of carbon dioxide. Currently, we do not know for sure who is to blame for these new forest fires. However, environmental group, World Wildlife Fund (WWF) Indonesia - who have been highlighting the issue for years in the country – says that it is caused by the “collective negligence” of companies, smallholders and government. 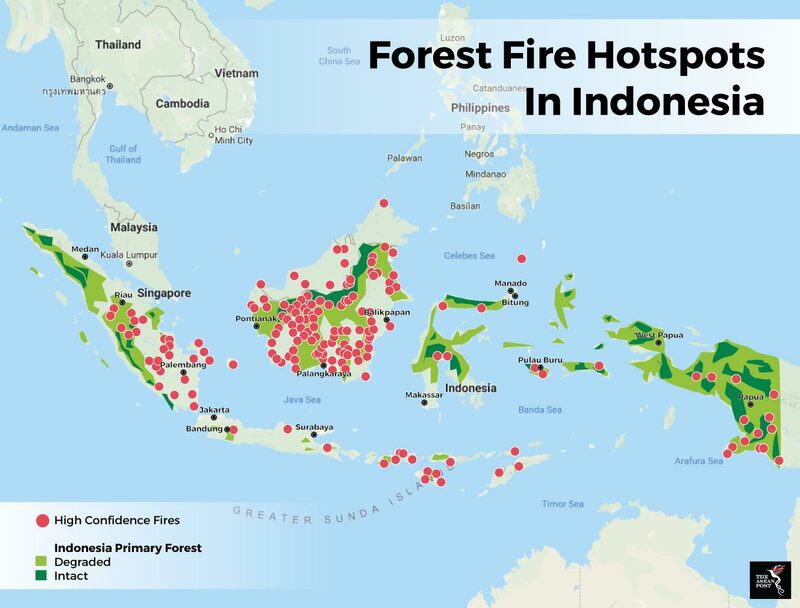 According to an analysis of World Resources Institute data based on the September 2015 fires -which recorded the highest amount of carbon produced - more than one-third of the fires in Sumatra occurred on pulpwood concessions. A good proportion of the rest are on or near land used by palm oil producers. Indonesia’s tropical forests are some of the most diverse ecosystems in the world. With the recurring forest fires, deforestation and loss of forest cover is inevitable. This in turn, endangers various flora and fauna, some that are already on the brink of extinction. As for the effects on the population, there are many cases of respiratory tract infections and even some fatalities. In the case of the 2015 forest fires, it was estimated that more than 100,000 premature deaths were caused by it. As a result, the economy of the country has been affected by the loss of natural and human resources. After the 2015 incident, financial damage to the region’s economy was estimated at 2 percent of Indonesia’s GDP, according to the World Bank. Some US$935 million was lost in relation to agricultural produce and trade - just in the Riau province alone. With Indonesia set to host the Asian Games in 2018, the issue of forest fires is a major concern to the government given the propensity of fires in the province. The games are scheduled to take place during the dry season in Jakarta and Palembang and will accommodate roughly tens of thousands of athletes and visitors from around Asia. Currently, to curb the forest fires, officials are preparing planes for cloud seeding and helicopters for water bombing. The BNPB will also be deploying soldiers, police, firefighters and volunteers to combat the fires. However, in order to ensure forest fires do not get out of hand, especially as the country gears up for the international games, the government must tighten controls and fast track certain infrastructure programs such as the proposed peatland rewetting systems. Apart from that, adequate monitoring should also be carried out so that carbon-rich peatlands that fall within private and public concessions are protected and preserved.